Over the years, I have seen a lot of conflicting advice on how to properly fix a ball mark on a green. I have in fact seen two entirely different methods demonstrated by two different professional greenskeepers. Do you lift? twist? hash? push? pull? leverage? None of the above? 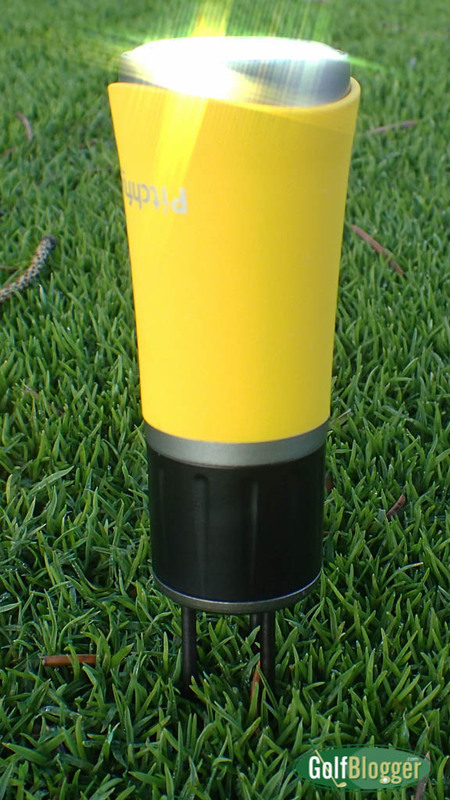 The Pitchfix Twister aims to end the discussion by offering an entirely new way of fixing ball marks. 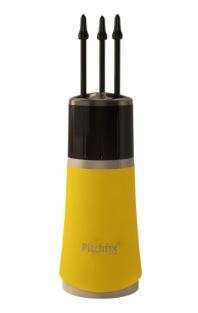 A squat, tubular device, the Pitchfix Twister extends three prongs when the body is rotated above the black cap. The Pitchfix Twister is about two-and-a-half inches long and an inch wide. The back end is recessed, and has a magnet to hold a standard sized ball marker. To use the Pitchfix Twister, extend the prongs by twisting the colored base of the device, then plunge them into the turf around the mark. After a couple of stabbing motions, the mark disappears. The Pitchfix Twister is very simple to use: twist to extend, stab (gently — can you gently stab something?) several times around the mark, then twist to retract before putting it back in your pocket. In terms of portability, the Pitchfix Twister is obviously a bit larger than the traditional flat, two-prong ball mark tool. I had no problem, however, with having it in my pocket. If you wear tight shorts or pants, however, it might be an issue. A side note: Everyone I know calls ball mark repair tools “Divot tools.” Given the vernacular, I am torn between using the term ball mark repair tool, pitch repair tool and divot tools. Pitchfix has a nice branding program that allows courses, shops, resorts, and other businesses to put their logos on the repair tools. My first encounter with a Pitchfix product was as a giveaway on a media trip that I took to a golf resort. As I arrived at the clubhouse on the morning of the first round of golf, a Pitchfix package with the course’s logo was waiting on the seat of the golf cart. My one complaint about the Pitchfix Twister is that the magnet on the rear doesn’t hold the ball mark securely enough for my comfort. In my pocket, the ball marker had a disturbing tendency to slide out of the recess. I can imagine pulling the Pitchfix Twister out of the pocket only to have the ball mark fly off into the unknown.